While cold fronts in the Earth's atmosphere are driven by rotation of the planet, those in the atmospheres of galaxy clusters like Perseus are caused by collisions between the cluster and other clusters of galaxies. These collisions typically occur as the gravity of the main cluster pulls the smaller cluster inward towards its central core. If the smaller cluster makes a close pass by the central core, the gravitational attraction between both structures causes the gas in the core to slosh around like wine swirled in a glass. The sloshing produces a spiral pattern of cold fronts moving outward through the cluster gas. A gigantic and resilient “cold front” hurtling through the Perseus galaxy cluster has been studied using data from NASA’s Chandra X-ray Observatory. These Chandra observations, coupled with the theoretical work, provide useful information about the strength of the magnetic field along the cold front. In their simulations the researchers tested the effects of three different magnetic field strengths. With the strongest magnetic field no split was seen in the cold front, and with the weakest magnetic field the cold front became blurred. Instead the simulation with an intermediate strength magnetic field reproduced the split cold front. 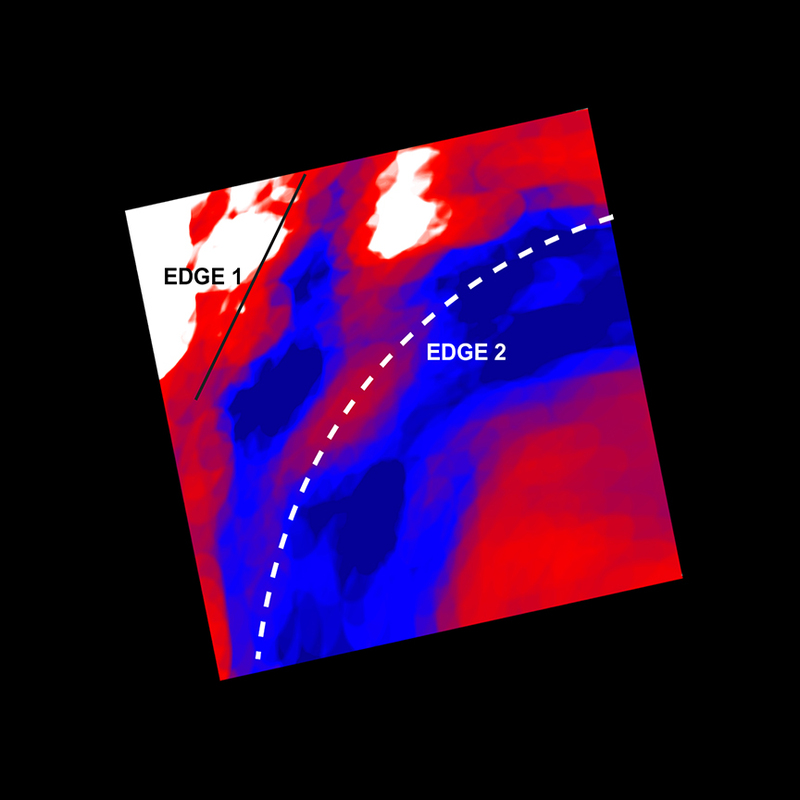 Aurora Simionescu and collaborators originally discovered the Perseus cold front in 2012 using data from the German ROSAT (the ROentgen SATellite), ESA's XMM-Newton Observatory, and Japan's Suzaku X-ray satellite. Chandra’s high-resolution X-ray vision allowed the first observation of the sharpness and splitting of the ancient cold front to be performed. Perseus is the same cluster where astronomers discovered sound waves with a note of B-flat 57 octaves below middle-C plus a giant waveabout twice the width of the Milky Way galaxy.